It’s one of my favourite times of the year again. The time of winter when a bunch of new beers make their way to the MLCC and beer vendors! Among the new releases, Molson has released a John H.R. Molson & Bros 1908 Pale Ale — brewed according to the brewmaster’s recipes dating back to 1908 and using hops from Oregon, Canada and the U.K. to give it a light bitterness reminiscent to beers savoured back in 1908. The 1908 Pale Ale is easily one of the best Molson products I’ve had in a long time. Microbrasserie Charlevoix’s award winning La Vache Folle Imperial Milk Stout is now available in Brandon! La Vache Folle is rated among one of the top milk stouts in the world. Out of Ontario, Sawdust City Brewing has two beers available including a Skinny Dippin’ Oatmeal Stout and Ol’Woody Altbier, this marks the first time that Sawdust City’s beers have been available in Manitoba. My favourite saison, La Saison de la Ceinture Fléchée by Winnipeg’s Half Pints is back in Brandon. You can actually find La Saison on tap at SUDS at Brandon University as well! The most interesting new release to me is a beer I had four years back - Route des Épices by Quebec microbrewery Dieu du Ciel. Route des Épices is one of the top five strangest beers I’ve ever had in my life. Essentially, Route des Épices is a rye pale ale brewed with black and green peppercorns. So, you’re probably already thinking “eww Cody, that’s just weird, who would want peppercorns in their beer?” Well, I’m not sure who would, but that’s what I love about beer - it can be just about anything you can think of! 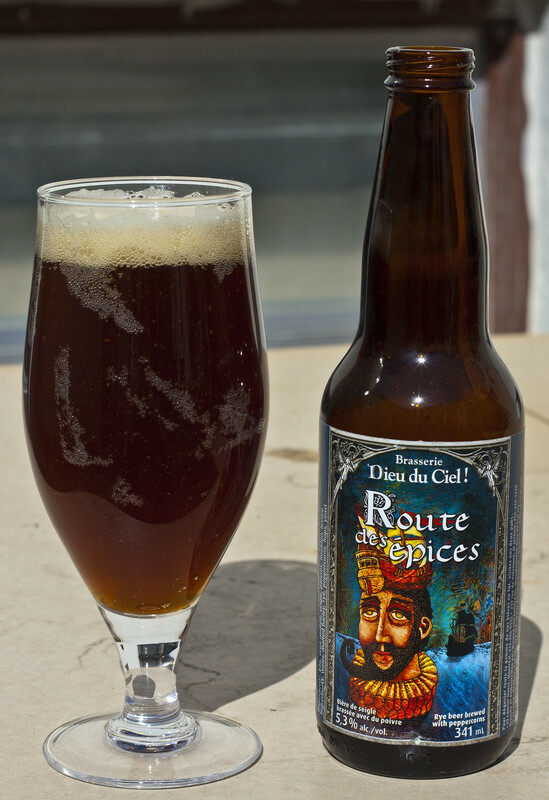 Route des Épices’ body pours a rich nutty brown with a nice cherrywood reddish hue to it. For the head, it’s a minimal amount of beige foam with a good deal of carbonation taking place. The aroma is a combination of rye malt and.. pepper. Rye malt is already known for being a bit spicier grain than barley or wheat, so to add black and green peppercorns to the mix just makes it a spice-filled ale. The aroma is a bit reminiscent of Rogue’s Chipotle Ale that was readily available in Manitoba until two years back. Aside from the aroma of rye and pepper, I find that there’s a faint note of ginger and caramel as well. The initial thoughts on the taste was that it was for sure a rye pale ale as it had grainy, moderately sweet and caramel flavour to it. However, the peppercorns quickly overtook the rye almost immediately, so here I’m getting the taste of freshly ground pepper, a moderate amount of burning sensation on the tongue from the peppercorns and even a lingering aftertaste of pepper. So as you can tell, this is a spicy, peppery beer with a bit of a rye bite to it.